The Stereo Effect has separate groups of effect slots for the left and right channels. After effects processing the two signals are mixed to stereo using their Volume and Pan controls. Use the Stereo Effect if you want to apply different effects to the left and right channels. You can, for instance, apply tremolo, vibrato or echo to one channel only. 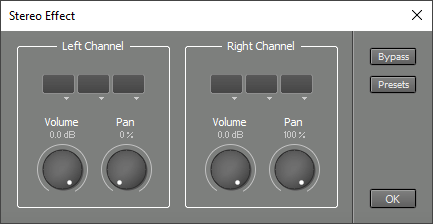 The Stereo Effect can also be used to narrow stereo-width or swap the channels (using the Pan knobs), or to mute one of the channels.